Administrative law is a dynamic subject that examines the legality of certain decisions taken by government and public bodies generally. Judicial review procedure is a mechanism by which individuals aggrieved by wrongful administrative action may seek redress by means of a public law remedy. 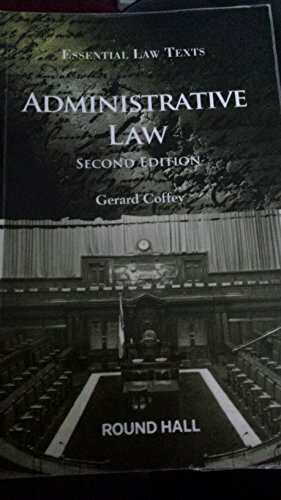 This book provides an up-to-date and comprehensive introduction to Irish administrative law and judicial review procedure. Each chapter includes extracts from leading cases, and suggestions for supplementary reading that provides direction for further investigation and study of key topics. It provides a clear explanation of the key principles and concepts for students, lawyers and others who require an understanding of the essentials of this subject. Administrative law is one of the core subjects required for entry to the professional course at the Honourable Society of King s Inns. Contents include: Introduction to the study of administrative law; scope of administrative law and judicial review; central and local government; the Ombudsman; fair procedures; the rule against bias; principle of legitimate expectations; function and control of discretionary powers; reasonableness; proportionality; duty to give reasons; judicial review procedure; public law remedies; public inquiries and tribunals of inquiry. The Author: Dr Gerard Coffey is a Lecturer in Law at the University of Limerick.